"Tribute to the Motown Years" with a special tribute to his father, Jackie Wilson. 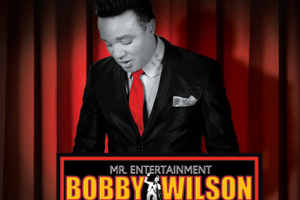 Bobby Wilson brings is a show about a son continuing the musical tradition set forth by his father, Legendary Soul R&B Artist Jackie Wilson and a continuation of that style of Soul music that began in the year of 1959! Imagine a hot summer night in Harlem New York, Theater, the music was new and no one could stop there body's from swaying or feet from taping. A debonair young man in a sharp dressed shark skin tailored suit with diamond cuff links, slides to the mic stand and hit his first note of the newest hit song "Lonely Teadrops", but wait, it's not 1959 but today and the man isn't Jackie Wilson, but his son Bobby Wilson. One has to pinch themselves because of the "IT" factor, this song and dance man apparently inherit from his Legendary Father. He has the moves, the swagger, and the audience in the palm of his hands as his movement through the years of Motown music and beyond air lifts the event "Higher and Higher" Plateau! Not only is his father Motown Royalty but his father first cousin Levi Stubbs and Lawrence Patton of " The Four Tops" all grew up in the same hood not to mention the penmanship of his songs by Berry Gordy Jr and T. Carlo which happens to be a cousin too. In this fantastic live show, you will enjoy the music of Jackie Wilson, Sam Cooke, Little Richard, Stevie Wonder, The Temptations, Sammy Davis Jr and more!